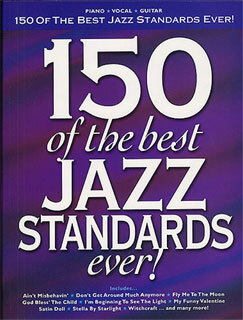 Hal Leonard 150 Of The Best Jazz Standards Ever! A great selection of 150 of the best jazz songs, standards and swinging classics of all time! All songs are specially arranged for piano, voice, and guitar. Includes: Aint Misbehavin, Dont Get Around Much Anymore, Fly Me To The Moon, God Bless The Child, Im Beginning To See The Light, My Funny Valentine, Satin Doll, Stella By Starlight, Witchcraft, Call Me Irresponsible, Unforgettable, and Have You Met Miss Jones?